Kiev “sees no alternative” to the Minsk ceasefire accords, President Petro Poroshenko said. However, the Ukrainian military is building up troops in the east to conduct “an adequate response” to the militia advancement, the Defense Ministry stated. The violence in eastern Ukraine escalated recently with the ceasefire deal penned in Minsk last year finally shattering. Ukraine last week attempted to launch a massive offensive operation against militia positions, but it ended in failure. Their opponents have since pressed forward and gained ground, advancing in the direction of the port city of Mariupol in the south of the Donetsk region. Amid an apparent setback for the Ukrainian military, President Petro Poroshenko called for sticking to the Minsk accord. “The Minsk agreement is a priority for us, we don’t see any alternative to it. We will not allow it to be undermined. Everything relies on it. Now we must implement it comprehensively and accurately,” the Ukrainian president said. The ceasefire deal between Kiev and the militia forces, which was sponsored by the OSCE and Russia, was never fully implemented. It helped tone down the violence, but OSCE monitors reported regular violations committed by both sides of the conflict. The self-proclaimed Donetsk and Lugansk Republics accused Kiev’s troops of launching regular attacks on residential areas of Donetsk, Lugansk and other cities. While the tension continued, Kiev angled for switching the peace negotiation from Minsk to another format - the so-called “Normandy format” - which would exclude the rebels and include several Western nations. Attempts for talks were virtually abandoned recently, with two key meetings canceled due to failure to agree on an agenda. As Poroshenko demonstrates a willingness to talk directly to the rebels, his military are building up troops in the east of the country. “To respond adequately to the actions of the 'terrorist' groups, we are continuing to build up reserves in practically all sectors where combat action is being conducted,” Defense Minister Stepan Poltorak said on Sunday. The militia said they no longer trusted Poroshenko and his calls for peace after months of the ceasefire. “Poroshenko is cynical beyond all limits. For us the Minsk process was a question of life for our civilians. For Kiev it was a cover [for preparing the offensive],” Denis Pushilin, a Donbass representative in Minsk, told Interfax. “Why do they pretend in the US and Europe that they don’t see Kiev’s aggressive policies? It’s business for them in Washington, and we are being killed here,” he added. Serbia which is the current chairman of OSCE has announced convening a meeting of OSCE Permanent Council on Monday at 1500 GMT to discuss the situation in eastern Ukraine. Vice-President of the European Commission Federica Mogherini also said extraordinary meeting of EU countries over Ukrainian crisis would be held on Thursday. The violence in eastern Ukraine has claimed more than 5,000 lives, according to the latest UN count, and sent some 1.5 million refugees fleeing for their lives to Russia or other parts of Ukraine. The episode in Mariupol on Saturday claimed 30 lives, when a barrage of rockets hit a residential area in the east of the port city. Kiev was quick to accuse the militia of launching the attack, which the latter denied. The Donetsk Republic leader said that after "Kiev decided to shift the blame on us for its erroneous fire from Grad multiple rocket launchers at residential areas [in Mariupol]," he gave an order to suppress the positions of the Ukrainian military stationed east of the port city. 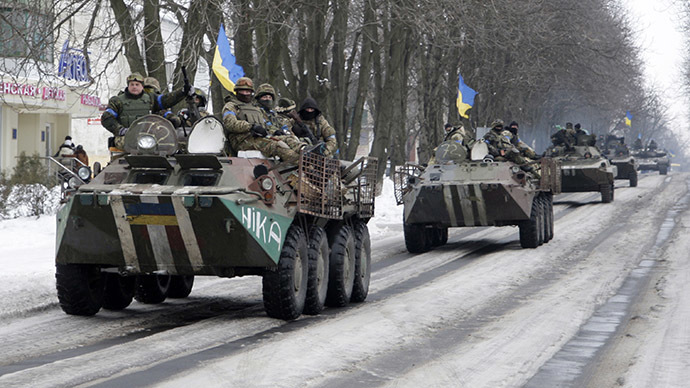 It remains unclear whether militia forces will be strong enough to take over Mariupol. Over the months of the ceasefire, the Ukrainian military has fortified its positions around the militia-held areas. During a phone conversation on Sunday, Russia’s Foreign Minister Sergey Lavrov and US Secretary of State John Kerry, called for an immediate cessation of shelling in eastern Ukraine and for the withdrawal of heavy weaponry, the Russian Foreign Ministry said in a statement. Both Moscow and Washington confirmed their readiness to promote a peaceful resolution to the Ukrainian crisis, with Lavrov stressing that “actual results may only be achieved through direct dialogue with Donetsk and Lugansk, which Kiev is avoiding by all means, taking a clear course at the violent suppression of southeastern Ukraine." The Russian FM also urged the US to use its influence on the Ukrainian authorities in Kiev in order to persuade them to backtrack from the military scenario, they said. In another phone call with High Representative of the European Union for Foreign Affairs and Security Policy, Federica Mogherini, Lavrov stressed the shelling of Donetsk and Mariupol should get an objective investigation, with the involvement of OSCE observers.